No more trimming and leveling, and no fancy tools needed! Come learn how to easily bake flat, even cake layers every time. Leveling cakes is super frustrating, right? First off, it’s hard to get it perfectly even without a fancy cake leveler tool, and secondly, you waste so much cake. I like snacking on trimmings as much as the next gal, but I like fuller, taller cakes more. So how to I do it? Then I use the scale to pour that amount into each cake pan. If you don’t have a kitchen scale, you should get one! Here’s what I use. You could also find the total volume of the cake batter and go from there, but that dirties more dishes and is less accurate. Baking at a lower temperature slows the spring in the leavening, which prevents a dome from forming on your cake. Most cakes bake at 350 degrees Fahrenheit. Reducing the temperature to 325 degrees is all you need to do to get a flat-topped cake. I usually take a quick peek once I’ve reached the original baking time and then every 5 minutes after that just to be sure I don’t over bake it, but the adjustment above is usually pretty accurate. Once the center of the cake(s) is set and don’t jiggle when pans are lightly shaken, test for doneness by gently tapping the center. If it bounces back, it’s done. 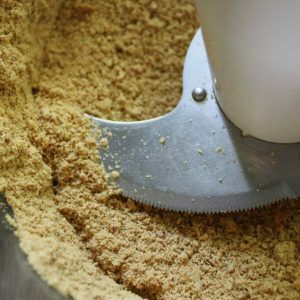 You can also insert a toothpick into the center, and if it comes out with just a few moist crumbs, your cake is done. Always remember that cakes are delicate, so minimize how often you open the oven door. Looks to me like it would be a lot easier just cutting a little bit of the top off. You lost me at measuring the amount in each pan. I would have thought so too until I actually bought a kitchen scale. Now I LIVE being able to measure everything so accurately. 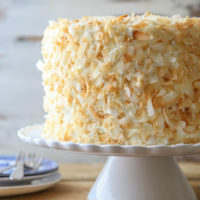 I’ve done this and the sides of the cake have come out perfectly soft on texture but the top is still slightly too crunchy that when eating you can feel the crunchier texture. Is there a way to ensure the top of the cake comes out soft like the sides and in your picture? This is great info. Can’t wait to try it out. Pinned. Lowering the temperature, huh? Never thought about it. Will try this next time I bake a cake. Oh, nice! I did not know this! Would this work for a 9×13 cake? I would assume so… Pinned. Yes, it should still work, though I’ve never actually tried it myself. It’s been a surprisingly long time since I’ve baked a 9×13 inch cake. But the principal is still the same. If you have any feedback after giving it a try, I’d love it if you came back and shared! Absolutely! Thank you for a quick response. My goodness, you are a genius. Seriously, can’t wait to try this. Thank you so much! I can’t remember where I learned it from, but it is definitely too good of a tip to keep to myself! You just saved me soooo much time!! Love this post! Thanks for the tip! That’s always so frustrating when this dome appears! Concerning a measuring converter, I have the App “Units” on my IPhone as I read a lot of American blogs, but we use kilos, meters, Celsius in Switzerland 😉 ! 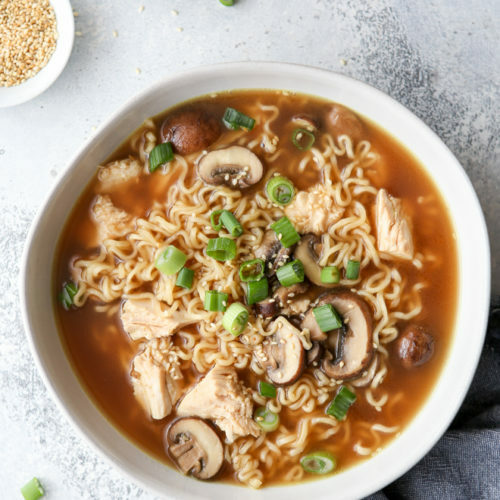 I’ve always heard of lowering the temperature but never tried it because I was afraid it would have an affect on texture – but you’ve convinced me! Great post! I have never noticed a change in texture. Thanks! 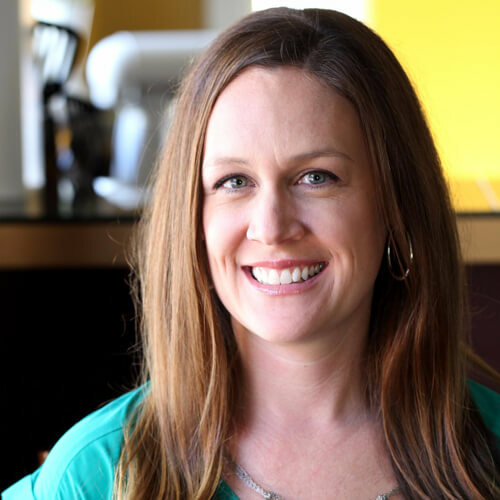 Thanks for the great tip, Kelli! I use Wilton’s Bake-Even Strips around my cake pans. My cake layers come out level every time. I’ve heard that! But never wanted to go to the trouble of buying them. My kitchen is too small! 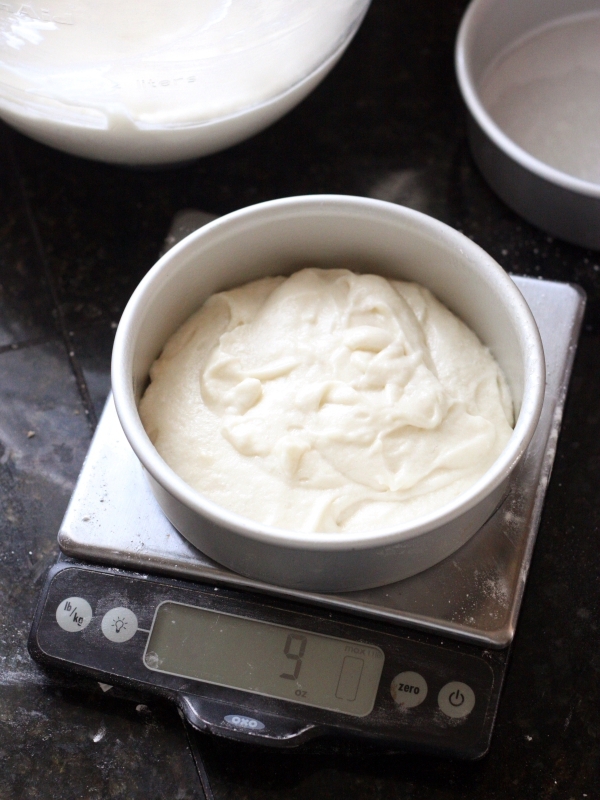 lol you can just save yourself the trouble of doing the math by placing the cake pan on the scale, zeroing the scale, and THEN adding your cake batter…..
That’s exactly what I do! But it doesn’t really work for finding the total weight of the batter before pouring it in the pans. You’ll need to know the weight of your bowl so you can subtract it. Wow! After 40+ years of baking, such a simple fix! Regarding weighing the batter, you don’t need to subtract, just put equal weights in each pan. Sometimes you need to fuss a tablespoon or so back and forth 😉 Regarding the bake even strips….yes they work but are a major PAIN to use. This method sounds so very simple! Thanks! why do you need to know the batter weight before going into pan? I like to know how much batter I’m going to put in each pan, so I get the weight of the batter and then do the math. Then I put the pans on the scale one at a time, zero it out and add that much batter. If you’re better at guessing than I am you can skip it. I just don’t like to go back and forth an ounce or two getting them even, if that makes sense. Yeah, that’s what I was going to say! Thanks for the tips! Here is the actual math conversion but there are so many sites that will just do the math for you. So, bake at 165° Celsius. good lord, woman! I like the way you bake. thanks for the tips. Sometimes, my pans laugh instead of giggle. How do you get your measurements for the amount of batter to use for the size of cake tin? I rely on the recipe to tell me what size pan and how many to use. Also, as a general rule, I do not fill my cake pans more than 2/3 full. I always bake my cakes at a lower temp. than recipes specify but I also rap the bottom of the pans on the counter to deflate bubbles; while I always get level cakes, there is minimal rise. The cakes are still fluffy but I heard that rapping the pans deflates the batter. Is this what is causing the cakes not to rise? 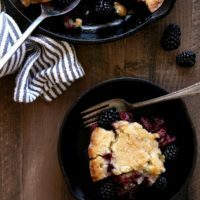 Hi, this is an interesting article, and I agree with equal amounts of batter in pans and lowering the temperature, I do that for less browning on sides and sure the dome is smaller. But, it depens on the recipe. The dome comes from the levening agent too, like baking soda or baking powder. So, some recipes will still have a dome, even after your instructions, while others can have no dome. You didnt specidy what recipe you used. The recipe I use for lemon cake, red velvet does not make a dome, while the pound cake, even with your instructions still has a dome. Thank you for your input! I have actually never had a recipe baked with these instructions either have no doming or considerably less doming. I follow these instructions with all of my layer cake recipes. 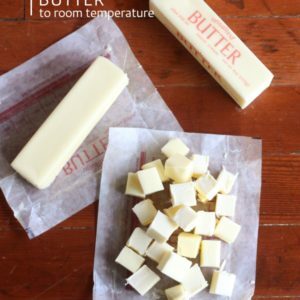 So this would also work on cakes that you bake that you need to bake longer? I have that delicious choc cake of inspired by chocolate Michelle and find that when I bake it at recommended heat that the smaller cakes are fine but when I bake cakes in bigger diameter they always seem to get real toasty on the outside edge and on top, with center sometimes being almost underbaked? Sounds like maybe your oven temp is off? Try inserting an oven thermometer before preheating and seeing if it reads the same. If the oven is too hot that could be why the edges burn before the center cooks completely. Good luck! I always encounter same problem with sponge cake. Normally we are nt allow to insert toothpick in the center for sponge cake. My sponge cake remains unbaked in the centre, even thought it cracks on the top. Oven temperature sounds good. So what else could help me please? 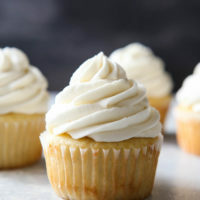 Will this work for cupcakes too?? Just google, “Fahrenheit to Celsius Calculator”, and Google has their own calculator at the top of the page. To convert from Fahrenheit to Celcius, subract 32, divide by 9 and multiply by 5. That’s great! I didn’t know that convertion, very useful. Thks for sharing yr knowledge. OK so I have read all of your comments and I can only say that many many years ago when I was doing all that baking (still do some but no where near what I used to) I used a very simple method for smoothing out the cake domes. The minute your cake is removed from the oven, either use an oven mitt or just a pot holder and lay on the top of your cake. Press down to remove the air and the dome goes away on its own. Hope this helps! I think I have actually heard of that tip before, but haven’t tried it myself. Thanks for reminding me to see how it works next time I bake a cake! Annalise, let me know if you try this. I just wanted to add not to push too hard on the cake but still kind of firm. You can actually watch the top and tell when you have reached the point of evenness. 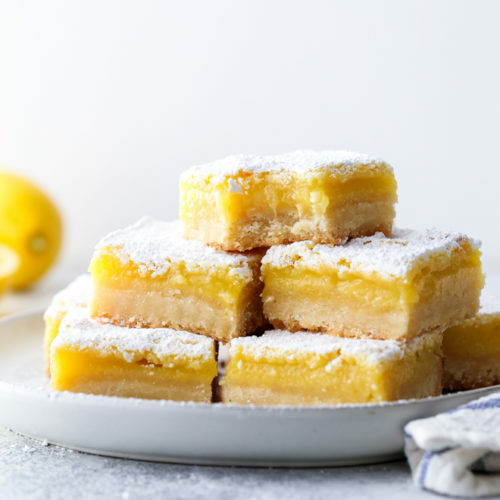 Does this work with box cake mix, or just cakes from scratch? While I haven’t tried it with a boxed cake mix, the principle is still the same and I believe it will work. Hello! Thanks for sharing this very helpful tip in baking cakes. 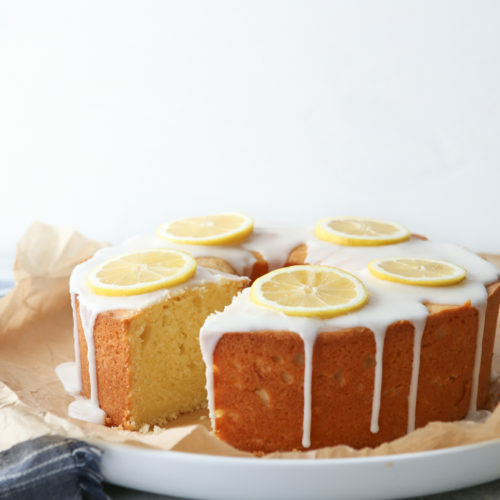 I was wonder inc if you can give me the recipe for this wonderful cake you post here…it looks delish! Hi Delisse! I believe the layers shown in this post were destined for this Bunny Surprise Cake. Thank you! You are so nice to share. I tried every part of this trick, but my cakes still turned out without a flat top. Hi Stephanie, sorry it’s not working for you. Have you tried testing the temperature of your oven? Maybe it’s off. You can try reducing the temp another 15-25 degrees and see if that does the trick (just remember that will extend the baking time further). Also, sometimes mine still come out with a little bit of a dome, but it usually flattens itself out in the fridge overnight before I decorate it. Hope this helps! I’ve been baking for 56 years and never had a cake dome in the center. My grandmother taught me how to bake when I was 9 and her “trick” for baking a flat layer cake. Eyeball the batter trying to put the same amount of batter in each pan. The trick…take the cake pan and hold it on the sides, give a good tap/bang on the counter and bake according to your recipe. Works every time. No need for special gadgets. What about using a convection oven? From what I understand, if I use the convection baking option it automatically reduces the temperature, but I still cook for the same amount of time. Do you know if that’s accurate? Hi Jennifer! I’m afraid I don’t have any experience with convection ovens so I can’t offer any advice. Hopefully another reader can chime in! Does anyone know the exact recipe fr this cake?and does it work ? I believe the layers pictured here were actually for this bunny cake. 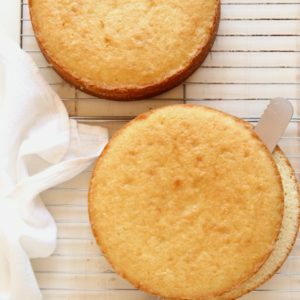 If you’re looking for a basic vanilla cake recipe, this one is my favorite. I am still very confused about the formula for arriving at the total weight for each pan. When you say to divide the weight of the batter by the # of pans. How does the size of the pans figure in? For instance if you have 2 pans but one is an 8″ pan and one is a 10″ pan, then the weights would be different, right? 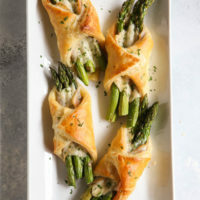 I really would like to figure this out since my pans seem to always be to full and make a mess in the oven, but I am trying to get them to rise to the top so I can cut them off level! I am so happy I stumbled across this on Pinterest! My favorite chocolate cake recipe – Hershey’s Especially Dark – not only domes terribly, but always domes lopsided despite my best efforts to rotate the pans. I just tried your trick, although I only decreased the temp to 335 because I was afraid that with three pans in the oven 325 would be too low. It did dome, but only a teensy bit, and not lopsided! Thank you for solving the mystery for me!! Do you have a trick for cutting the layers in half evenly? Like if you’re turning two layers into four. You know, Chelsea, I don’t. I usually eyeball it as best as I can with a very large serrated knife. Or I’ll put a few toothpicks in place to act as a guide. But most often I just take the extra time to bake the 4 cake layers instead of 2 so that I don’t have to worry about halving it. I wish I was more help, sorry! If you want to bake 4 layers at the same time I would place 2 on each oven rack, spacing the oven racks evenly in the top and bottom thirds of the oven. You may need to rotate the pans halfway through so they bake evenly, but the total baking time may not be that different. Just keep an eye on them. Hope this helps! How long do you normally leave your cake to cool in the pan before inverting it on a wire rack to cool completely? Hi Emily! I usually leave the cake in the pan for about 15 minutes, but sometimes longer if I’m lazy. Amazing! Such simple tricks! I really wanted to “striped” cake (not frosting the sides to see the layers) but was dreading splitting the 2 layers! Now I can just bake in 4 pans with your tricks! THANK YOU!! 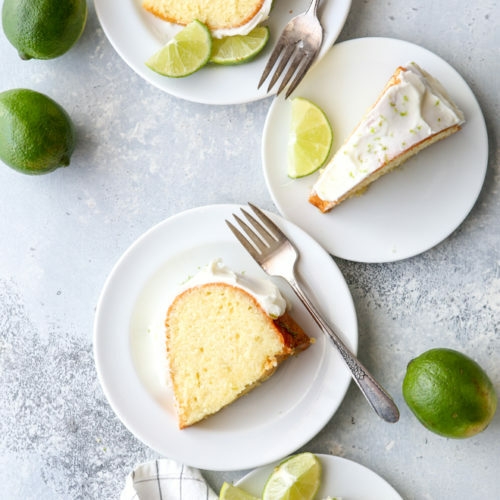 This whole concept is interesting, I’ve thought about measuring cake batter for even layers but never tried it….how about just measuring the actual cake batter using measuring cups as you scoop it into the pans, might work also, great post though:)…. I’ve used a large ice cream scoop to fill the pans evenly. Start with 4 or 5 scoops in each pan for a 2 layer cake, then divide the remainder between the pans. Will this work for a 13 x 9 cake? I have to make the cake level as possible because two more layers of cream have to go on top. The same principle should apply, yes, though I haven’t tried it myself to give you any tips on time, etc. Keep an eye on it, but try to limit how often you open the oven door to prevent the cake from falling. Good luck! I worked in a bakery for several years, and here are a few secrets. 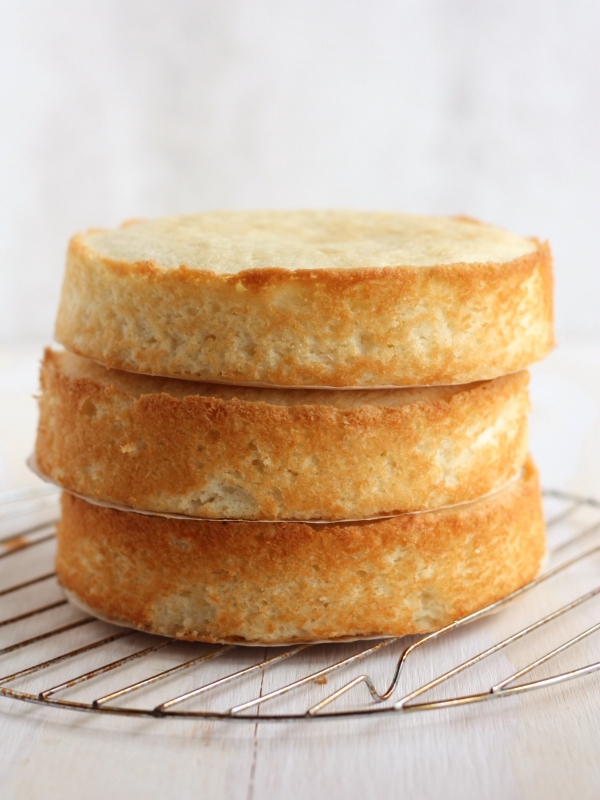 ALWAYS line your pans with parchment rounds; after cooling for ten minutes, turn the cake out onto a cake round…Now the perfectly flat bottom is the top and the weight of the cake will flatten what was the top to make the new bottom. Got it ? Okay. Last hint…if you have to torte the layer, do it after chilling, and cut a tiny “V” at the edge of the layer before you torte it. Even if you cut at an angle, when you line up the “V” after icing or filling , the layers will still be flat. I wish I could draw you a picture…but think about it, it will make sense…works every time. Just found your blog, but I’ll be back! Great info! 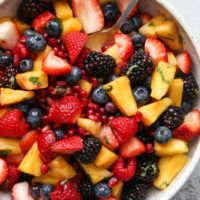 Do you think this will work well on eggless cakes too? And do you recommend freezing eggless cakes as well? I don’t see why you couldn’t bake your egg-free cake with this tip, or why you couldn’t freeze egg-free cakes, but I don’t think I’ve ever specifically tried it! I made a large cake (2 cake mixes in each pan). I turned the oven to 325 degrees and also added a little more time like you mentioned. I also put a damp, not wet, tea towel on top of cake and gently push for 10 seconds to desired level, then slam the cake minus the tea towel upside down onto my counter that was covered in cling wrap then wrap very loosely because it will shrink to fit cake. Let it cool completely…overnight. Freeze as is until needed. It keeps cake moist. I did this for a big graduation party and it was delicious. I forgot to mention that I line my pan bottoms with parchment paper. Sounds scary, but it works great! Hi. I didn’t see any comments on how you prepared the pan? Traditional grease and flour? Cooking spray? I usually use a baking spray, but you can read more about about how to prep cake layers here. I’ve just tried Shirley’s tip and applied light pressure to the top of my 12 inch square cake that domed despite the homemade baking strips. It worked! Yay! Thanks so much for the feedback! Another way to reduce or eliminate doming of your cakes is to wrap your pans with a damp towel that you’ve secured with a safety pin. 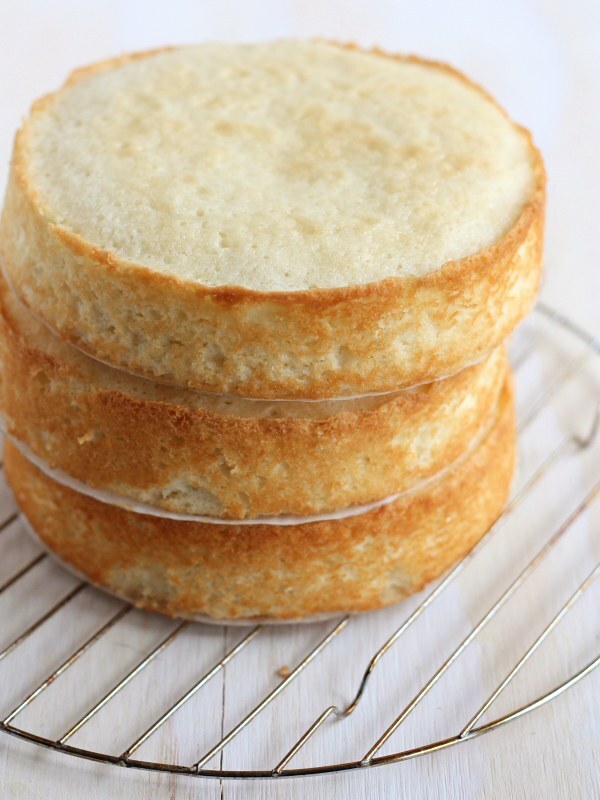 This helps to keep the outside of the pan a slightly lower temperature, allowing the cake to rise evenly. This is so, so much helpful….thank you!! You explain this all the complex process in easiest way. Wonderful! So happy you found this helpful. What would be the time for a 6 inch pan? BTW love your website and the simple to understand tutorials!